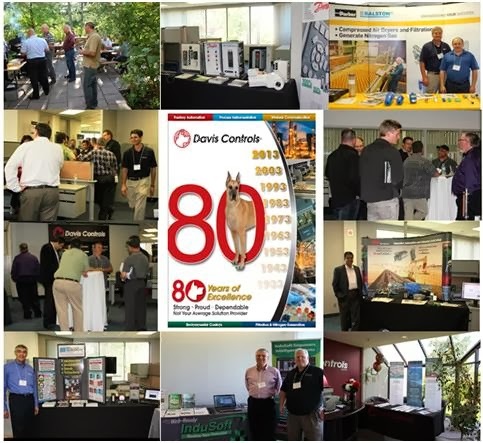 Sept. 01, 2013 marked the 80th Anniversary of the foundation of Davis Controls Ltd.
Hardly a day goes by that I don’t think about how different my life might have been without Davis Controls. My father joined the company when I was five years old, and so for nearly 60 years now, my family has depended on DCL for our health and wellbeing. More than 150 Customers, Suppliers and Employees took time out of their busy schedules to drop in to meet the people they work over the phone with on a regular basis. Good weather, good company, good conversations and good food helped to make the day memorable. Thank You to everyone who came to visit! Ø The new roof over the office half of the building is finished. Ø We have added a Balston Product Specialist based in Edmonton, AB to service our customer base in Western Canada. Ø The winner of our business card draw for a $200.00 gift certificate for The KEG Steakhouse + Bar was Ed Mueller from Crown Food Services. Congratulations Ed !